Previously destroyed by the 2004 tsunami and Sri Lankan civil war, the Kalkudah beach has regained its popularity among foreign tourists. A long and vast stretch of white silky sand, clear blue water and stretches of trees characterize this popular beach. During the month of September, surfing, windsurfing and diving are activities that one simply cannot miss at the beach! During the early morning hours, seeing the fishermen return with nets of captured fish is an interesting sight, especially to understand their daily life. 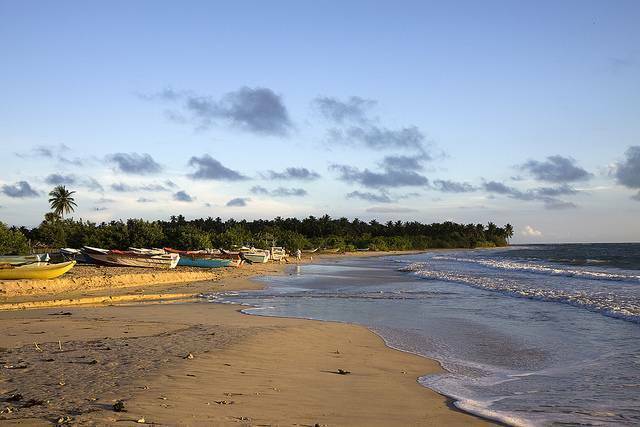 On the other hand, Passekudah Bay, which is located on the southern part of the beach, is a sickle-shaped stretch of paradise! Famously known for its shallow waters and coral reefs, the bay is a wonderful place to swim freely and even go snorkeling. Plenty of sophisticated resorts and hotels line the coast, and provide world class facilities and recreation activities. For budget travelers, delightful little hotels and guesthouses are available, which give visitors a greater experience of the natives’ local life. Both the beach and the bay are yet relatively unspoiled, but may soon become victims of extreme commercialization. So hurry up, pack your bags and rush to this exotic place before its untouched wholesomeness runs out!